With the London 2012 Olympics just 157 days away Nike pulls out the big guns, showing off their latest super lightweight, advanced marathon running shoes - the Nike Flyknit Racers - weighing just 160 grams - and the Nike Flynit Trainer+. Olympic legend Carl Lewis joined top US and Russian athletes on stage in New York today to show off Nike's newest innovation in running apparel, including the latest long distance running shoes - the Nike FlyKnit Racers. 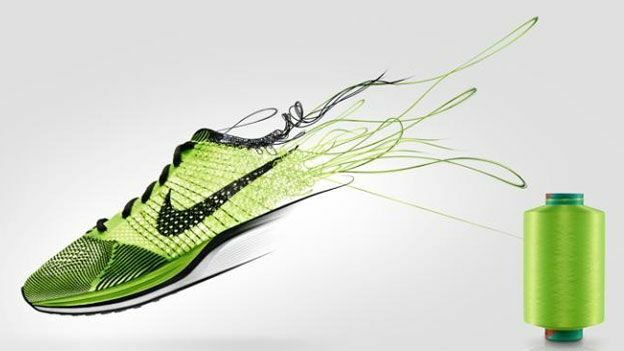 According to the sportswear giant the the Nike Flyknit "revolutionizes running by rethinking shoe construction from the ground up" and claims to save runners the equivalent of carrying a car over the 26.2 miles of an Olympic marathon. Probably not a Volvo Estate. Yarns and fabric variations are precisely engineered only where they are needed for a featherweight, virtually seamless upper. The structure and support has been knitted in, to ensure the Nike Flyknit Racer's upper and tongue weigh just 34 grams (1.2 ounces). The whole Flyknit Racer shoe weighs just 160g (5.6 ounces) for a size 9, 19% lighter than the Nike Zoom Streak 3, a shoe worn by first, second and third place athletes in the men's marathon at the 2011 World Championships. You can expect to see these next on the roads of London and the tracks of the Olympic stadium at 2012. Whether they will be on the feet of a gold medallist is still up for grabs. For us mere mortals the Flyknit tech will also make its way into an everyday running range the Nike Flyknit Trainer+. Today's Nike Innovation Summit also saw the covers come off the new Nike Pro TurboSpeed Suit that Nike claims is their lightest and fastest running suit ever with a 0.43 second advantage over your average singlet.